A regular summer resident and migrant; regular in winter in the southern half of the state. The Brown-headed Cowbird was an abundant species during the Minnesota Breeding Bird Atlas (MNBBA). Distributed throughout much of the United States, southern Canada, and northern Mexico, the Brown-headed Cowbird is abundant throughout the central U.S. and Canadian Prairie Provinces. It reaches its highest breeding densities in central North Dakota (Figure 1). Northern populations, including in Minnesota, are short-distance migrants that winter in the southern United States and Mexico; southern populations are year-round residents. A ground forager consuming primarily seeds, some grains, and insects. A brood parasite, the Brown-headed Cowbird female lays her eggs in the nests of other species. Breeding distribution and relative abundance of the Brown-headed Cowbird in North America based on the federal Breeding Bird Survey from 2011 to 2015 (Sauer et al. 2017). The Brown-headed Cowbird is a widespread and abundant breeding resident in Minnesota. Maligned for its parasitic nesting habits, it was described nearly 100 years ago by Roberts (1932) as “all too abundant in every section of Minnesota.” Although generally considered a beneficial species among farmers (Bent 1958), Roberts (1932) stated that “its practice of foisting its eggs and the rearing of its young upon other birds, generally of equal or greater value than itself, renders it undesirable.” Originally confined to the grasslands of central North America, the cowbird began its eastward expansion in the early 1800s as European settlers cleared the deciduous forests. By the late 1800s it already was deemed by Roberts to be statewide in distribution. His sweeping assessment, however, makes no distinction of its relative abundance in different regions of the state. No doubt, at the time the cowbird was far less abundant in the extensively forested landscape of northern Minnesota than it was in the southern and western agricultural regions of the state. Green and Janssen (1975) make brief mention of the species’ distribution, commenting only that it was a breeding resident throughout the state. Several years later, Janssen (1987) described it as being most numerous in Minnesota’s wooded regions, where nesting songbirds were abundant. This statement, however, seems contrary to the species’ origin in the western grasslands and to data collected by the federal Breeding Bird Survey (BBS), which illustrates higher abundances in western and southern Minnesota (Figure 1). Janssen included a map that identified 36 counties where the species had been confirmed parasitizing songbird nests since 1970. Hertzel and Janssen (1998) later added an additional 16 counties to the list of confirmations. Field biologists with the Minnesota Biological Survey have reported a total of 2,142 breeding season locations of Brown-headed Cowbirds. Although their records are widely distributed across the state, their distribution map is the first to depict the species relatively sparse distribution in the northeastern and north-central regions of the state. Indeed, their records only include one location in Cook County, while none were reported in Lake County (Minnesota Department of Natural Resources 2016). The MNBBA reported 5,170 cowbird records in 55.6% (2,646/4,759) of the atlas blocks that were surveyed and in 77.7% (1,816/2,337) of the priority blocks. Breeding parasitism was confirmed in 5.0% (240) of the surveyed blocks (Figures 2 and 3; Table 1). Birds were observed in all 87 Minnesota counties, and breeding evidence was gathered in 68 counties; Chippewa County was included because one block with confirmed nesting straddled both Chippewa and Yellow Medicine Counties. Widely distributed across the Prairie Parklands, Tallgrass Aspen Parklands, and Eastern Broadleaf Forest Provinces, cowbirds were more sparsely distributed in the eastern and far northern counties of the Laurentian Mixed Forest Province. Indeed, they were reported from only four blocks in Cook County and six blocks in Lake County. Although the cowbird remains least abundant in Minnesota’s northern forest, its broad habitat requirements allowed it to exploit the landscape as industrial and residential development expanded. A similar pattern occurred decades earlier as cowbirds expanded east from their primary habitat in the Central Plains. They spread throughout the eastern United States in the 1800s and early 1900s and through the southeastern Canadian provinces in the early half of the twentieth century. A similar expansion occurred westward into the Pacific Northwest (Lowther 1993). Breeding distribution of the Brown-headed Cowbird in Minnesota based on the Breeding Bird Atlas (2009 – 2013). Summary statistics of observations by breeding status category for the Brown-headed Cowbird in Minnesota based on all blocks (each 5 km x 5 km) surveyed during the Breeding Bird Atlas (2009-2013). Summary statistics for the Brown-headed Cowbird observations by breeding status category for all blocks and priority blocks (each 5 km x 5 km) surveyed during the Minnesota Breeding Bird Atlas (2009-2013). Historically Brown-headed Cowbirds were restricted to the grasslands of central North America. Also known as the “Buffalo Bird,” they were closely associated with the prairie’s largest herbivore, the bison. The open grasslands not only provided an abundance of prairie grass seeds, the bird’s primary food source, but also a diversity of grasshoppers, beetles, and other insects that were flushed from the ground by the bison’s movements (Bent 1958; Roberts 1932; Lowther 1993). As the northern and eastern forests were cleared, the open, fragmented landscapes that followed provided new opportunities for cowbirds to expand into regions previously unsuitable. Today the species is not only associated with farm livestock but with a wide variety of open habitats, ranging from forest edges, open woodlands, early successional forests, grasslands, and brushy thickets to old fields, farmsteads, and residential neighborhoods (Figure 4; Kaufman 1996; Danz et al. 2007; Lowther 1993). In a long-term study of forest birds on the four national forests in northern Wisconsin and Minnesota, Brown-headed Cowbirds were most closely associated with local towns and open, dry habitats (i.e. recent clearcuts and sites managed as upland brush) within these extensively forested landscapes (Niemi et al. 2016). During the MNBBA, Brown-headed Cowbirds also demonstrated a tolerance for a wide diversity of habitats within 200 meters of each point count where they were detected (Figure 5). Some of the highest associations were with oak forests, cropland, upland grasslands, and developed areas. A species largely dependent on fragmented landscapes, this ground forager requires open habitats for feeding. The female also searches for potential host nests as she perches in the tops of trees and shrubs, watching for the nest‑building activities of other birds in the surrounding areas (Lowther 1993). Many studies conducted in the Midwest have repeatedly shown that Brown-headed Cowbird parasitism is lowest in regions with a high proportion of forest cover (e.g., Robinson 1995; Donovan et al. 1997). Densely wooded habitats not only provide few feeding opportunities for the adults but also may increase the difficulty of searching for host nests. Fragmented landscapes, with multiple edges, were deemed more suitable, resulting in higher rates of parasitism (Wilcove et al. 1986; Paton 1994). Other studies, however, have demonstrated that this simple metric (i.e., high forest cover yields low cowbird parasitism) is more complicated, depending on the landscape context. Even in landscapes with a relatively high proportion of forest cover (30%–50%), the interior of the forests are as accessible to cowbirds as the edges, even though overall rates of parasitism may be lower than in more fragmented environments (Gustafson et al. 2002; Knutson et al. 2004). Typical breeding habitat of the Brown-headed Cowbird in Minnesota (© Lee A. Pfannmuller). Habitat profile for the Brown-headed Cowbird based on habitats within 200 m of point counts where the species was present during the Minnesota Breeding Bird Atlas (2009-2013). Data gathered by the BBS have generated a North American population estimate of 120 million breeding birds (Rosenberg et al. 2016). Several years earlier, Minnesota was estimated to support approximately 2.4% of the continental population (Partners in Flight Science Committee 2013), which would place the current population estimate at nearly 2.9 million birds. Across their breeding range, the highest densities of breeding birds are found just west of Minnesota, in the northern Great Plains of North and South Dakota (Figure 1). Indeed, in North Dakota the average number of cowbirds observed per year on BBS routes in the state is 93 birds; in South Dakota the average number is 52. This compares to an average of only 20 cowbirds observed per route per year in Minnesota (Sauer et al. 2017). In Minnesota’s forested landscape, where densities are expected to be significantly lower than in the southern region of the state, the relative density of cowbirds changes dramatically between the more centrally located Chippewa National Forest to the northeastern Superior National Forest. In the Chippewa, an average of five cowbirds were reported on 100-10 minute unlimited distance point counts from 1991 to 2010; in the Superior an average of less than one was reported (Niemi et al. 2016). Clearly the more densely forested landscape of northeastern Minnesota is less hospitable to cowbirds. Despite their abundance, Brown-headed Cowbirds have declined since long-term monitoring by the BBS began in 1966. Survey-wide they have demonstrated a statistically significant decline of 0.66% per year since 1966 (Sauer et al. 2017). The trend has been quite similar in Minnesota, where cowbirds also have experienced a significant decline, averaging 0.78% per year since 1967 (Figure 6). In the most recent ten year reporting period, however, from 2005-2015, populations at both the national and state level have stabilized. Few studies have examined the factors responsible for the changes in cowbird population numbers. Given the cowbird’s role in negatively impacting the reproductive success of other songbird species, particularly at the local level, the decline of cowbirds generally has been regarded positively. A study in Missouri, however, linked the species’ long-term decline to at least two factors: 1) a more than 40% decline in the state’s cattle production from 1975 to 2009, which reduced foraging habitat; and 2) an 11% increase in forest cover between 1989 and 2010, which both reduced the amount of foraging habitat and increased the distances between foraging areas and host populations for breeding. As predicted, the decline in cowbird populations was concurrent with an increase in the productivity of three songbirds that served as cowbird hosts in the study area: Acadian Flycatchers, Northern Cardinals, and Indigo Buntings (Cox et al. 2012). 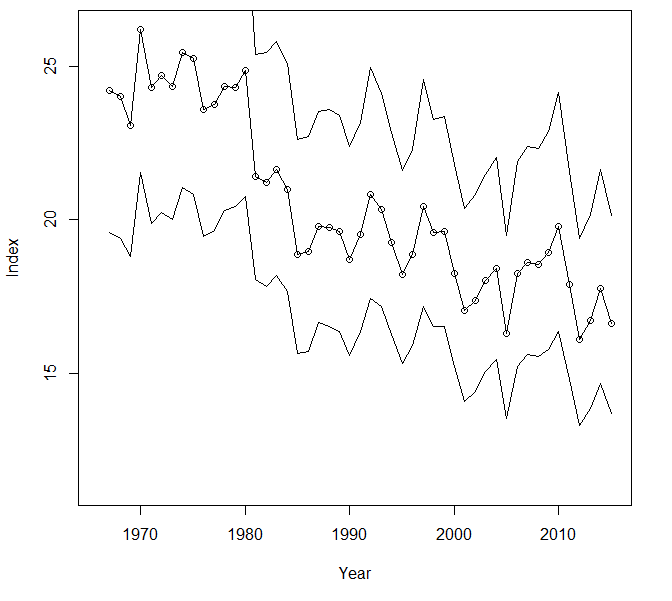 Breeding population trend for the Brown-headed Cowbird in Minnesota from 1967-2015 based on the federal Breeding Bird Survey (Sauer et al. 2017). Needless to say, ornithological studies addressing Brown-headed Cowbirds have focused on the negative impacts of cowbird parasitism to many songbird species, particularly rare species such as the Kirtland’s Warbler and Bell’s Vireo, where cowbird parasitism has contributed significantly to the species’ declines (Lowther 1993). Efforts to control cowbirds at Kirtland’s Warbler breeding sites in Michigan are well known. Although this federally endangered warbler is now considered recovered from the brink of extinction, the program to trap and remove cowbirds that began in 1972 will likely need to continue indefinitely to ensure current warbler populations are sustained (Bocetti et al. 2014). Despite its long-term decline, the Brown-headed Cowbird remains an abundant and widely distributed species that will remain a component of Minnesota avifauna for years to come. Warming temperatures do not appear to pose a threat to the species (North American Bird Conservation Initiative 2010). Assigned a relatively low Continental Concern Score of 7/20 (Rosenberg et al. 2016), it will likely continue to be the focus of studies that investigate its complex relationship to the reproductive success of the grassland and forest songbirds that it most frequently parasitizes. Donovan, Therese M., Peter W. Jones, Elizabeth M. Annand, and Frank R. Thompson III. 1997. “Variation in Local-Scale Edge Effects: Mechanisms and Landscape Context.” Ecology 78: 2064–2075. Gustafson, Eric J., Melinda G. Knutson, Gerald J. Niemi, and Mary A. Friberg. 2002. “Evaluation of Spatial Models to Predict Vulnerability of Forest Birds to Brood Parasitism by Cowbirds.” Ecological Applications 12: 412–426. Paton, Peter W. C. 1994. “The Effect of Edge on Avian Nest Success: How Strong is the Evidence?” Conservation Biology 8: 17–26. Wilcove, David S., Charles H. McLellan, and Andrew P. Dobson. 1986. “Habitat Fragmentation in the Temperate Zone.” In Conservation Biology: The Science of Scarcity and Diversity, edited by Michael E. Soule, 237–256. Sunderland, MA: Sinauer Associates, Inc.